Determine a proper rental rate: This is not something to be taken lightly. Evaluate your property thoroughly before you come up with a fixed rental rate. Perform a detailed documentation of the interior and exterior including pictures. Provide advice on repairs and cosmetic enhancements to maximise monthly rent while providing good Return On Investment (ROI). Gather usual rental rate data from other property owners in the area and decide an optimal rate. Discuss with other owners about the pros and cons of different policies like accepting pets, allowing smoking etc. Market your property for rent: Ensure cleanliness, interior appeal and manicured landscaping to increase your property’s appeal. Create advertisements customised to the property in advertising mediums such as magazines/publications, free or paid rental listing websites, fliers etc. you can also work with other realtors and leasing agents to find a tenant. Keep your phone with you always so your potential tenants can call directly to receive information about the property. Meet prospective tenants and show the property to them. Tenant screening and selection: Once you have chosen your list of prospective tenants, do a background check on them to verify their identity, income, rental history etc. Grade them based on your tenant criteria. Choose the one that ranks first on your list and informs others who were turned down. condition of the property prior to moving in. collect first month’s rent and security deposit beforehand. Rent collection: Establish a rent collection date and execute rent collection without fail. Hunting down late payments is a tiring and awkward process, enforce late fees and be sharp about it. Provide receipts for proper payments and fill relevant paperwork to initiate and complete an unlawful detainer action if eviction is needed. In case of eviction, coordinate with the law enforcement to remove the tenant and their possessions from the property. Periodic inspections: Perform periodic inspections of the interior and exterior on a predefined schedule to look for needs of repair, safety hazards, lease violations, code violations etc. 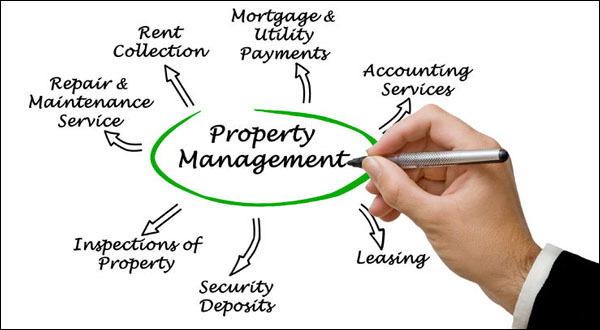 send detailed periodic reports of the inspection conducted on the condition of the property to the tenant. Maintenance: Establish a preventive maintenance policy to identify and deal with repair needs. Assign repairing/maintenance work to people who are best for the job for the best price. Maintain outdoor areas by landscaping, leaf and snow removal, trash and debris removal etc. Maintain a 24-hour emergency repair hotline. Tenant move out: If the lease period is over and the tenant is moving out, conduct an inspection of the property (interior & exterior) and fill out a report on the property’s condition when the tenant moves out. Provide a copy of the report and the estimated damages list to the tenant before they move out. Return the balance of the security deposit to the tenant. Clean the property and perform any repairs or upgrades needed. Re-key the locks and put the property back on the market for rent.